Thanks to Minight for posting this! 18cm Staute to debut in September! Looks amazing! Check out our forums to discuss! PACKAGING: Overall the package is sharp looking. Black with various grey images scattered around the box. The same as the Ultimate figure line. The picture of Goku is the same and in fact has the Series 2 lineup of the Ultimate Collection on the back. 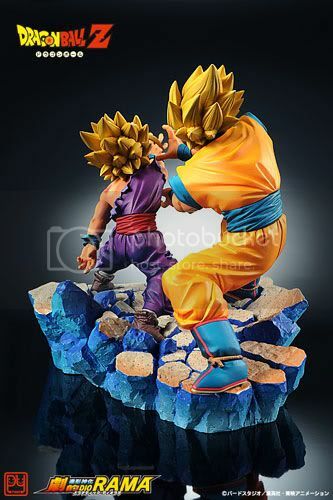 The box also has the counterpart Super Saiyan Majin Vegeta on the back. Nowhere on this box does it say what actual figure it is and just has item numbers all over it. The lines are clean and the pictures colors and packaging have a very uniform flow to them. PAINT/ SCULPT/ ARTICULATION: I have to say, the paint that is airbrushed overall on the hair, the muscles and the face all seem great. However what ruins this figure for me is the fact that they chose to go with the strangest orange for his gi. Head: The hair and face sculpt are both excellent on this figure. Painted and represented well. Full neck rotation. Chest / Back: The chest and gi are “battle damaged” and unpainted, the only negative I have about this figure, however the sculpt of the gi is awesome. 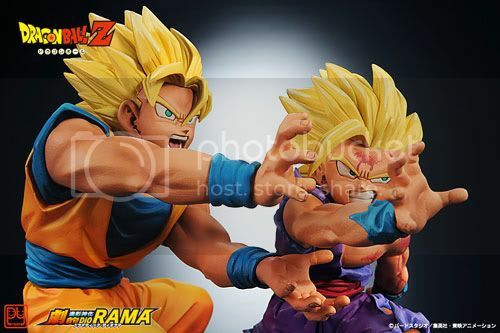 Arms: Two sets of arms are included with this figure: a set blasting energy from them and a set doing the kamehameha. Again, great sculpt and rotation. Legs: Full waist rotation no leg articulation and great sculpts all around down to his boots. Overall the sculpt is a great Goku figure, Goku looks like he means business and is poseable to be in various fighting stances. ACCESSORIES: This figure comes with a base and an extra set of arms, both are awesome for the stance you would like to have Goku in. COST & OVERALL IMPRESSION: Although I do not know the cost, I like this figure for the most part. Goku’s size, sculpt, articulation and accessories make him a great figure to add to any collection. Worth the look and the purchase. Bandai is back with the next series of Dragon Ball Z Ultimate Collection figures. Since Bandai reclaimed the rights to DragonBall in America they’ve released a number of different types of toys. These range from Japanese imports, miniatures, larger gimmick based figures, 6” highly detailed figures and the 4” Ultimate Collection. Of these all, the Ultimate Collection is the only series, which could be considered true articulated action figures. Bandai’s released two series so far consisting of mainly DBZ characters with a few DBGT ones thrown in. 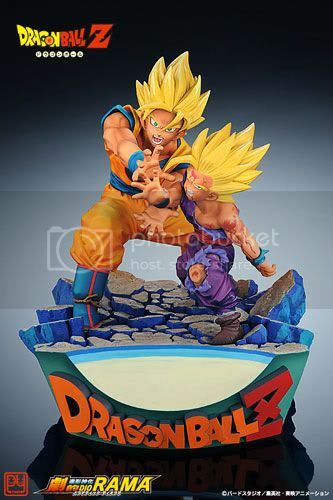 This newest series, unlike the previous ones, contains only two figures (Super Saiyan 3 Goku and Majin [Kid] Buu) each of which comes with an energy accessory as opposed to a build-a-figure piece. Therefore this series is most likely 2.5 and not a true a series 3. After having taken a close look at all the figures in the Dragonball: Evolution movie line individually, I think it’s important to take a step back and make a brief assessment of these toys. It’s been a fun time considering each of these by themselves, but I think the big picture is even more fascinating. PACKAGING: As I’ve mentioned in all of the individual reviews, the packaging on these figures really is great! Very sharp looking design, and beautiful colors. Most importantly, the packaging did make these figures stand out and look wonderful before opening. PAINT: The paint applications on these figures is not bad, it’s just a bit lazy. For example, the birds on Roshi’s shirt look very sharp and well done, but I was disappointed that they didn’t bother to paint the same birds on the back of his shirt. No consistency. It was also a shame that the pegs used to attach the arms and legs of these toys couldn’t have been painted. I know I’m not alone in my feeling, that this was the worst mistake in the whole series. My biggest complaint was the complete lack of paint on their accessories. Not one of the figures came with painted weapons, and because of this it was often hard to tell what they were. I felt that the Oozaru build-a-figure was great, but I also felt it was a wasted opportunity due to it’s lack of paint. ARTICULATION: These figures have a very good range of motion… at the sacrifice of sculpt. I fully admit that it’s a personal preference, but I would rather take fluent sculpture over being able to move part of an arm or leg a little bit more. ACCESSORIES: I love how much stuff you get, but I wish the weapons were painted. The Dragonballs, however, were beautifully done! Out of everything I will always keep these, as I think they are some of the nicest Dragonball’s ever made. The build-a-figure Oozaru IS a cool looking figure, but it’s also a figure that defies logic for so many reasons. For one, Oozaru just doesn’t look like this at all in the film. He’s also molded completely in clear blue plastic and I just can’t fathom the reasoning for this. OVERALL IMPRESSION: I can’t lie and say that I love these figures, but I certainly don’t hate them either. I respect the points that make them decent, but it’s hard to see a series like this as anything else but a missed opportunity. With all of the literally hundreds of Dragonball characters that never ever get to be immortalized into plastic play things, it’s frustrating to see a series like this even go into production. Toys based on versions of only a handful of characters - versions of which no one wants to see. Why take images so close to the hearts of fans, and change them so drastically? However, it’s not all the fault of the toy makers, and at the end of the day I do respect the film makers for trying something new and lending an old story a new interpretation. Regardless of the baffling nature of these toys, I am happy to have them in my collection, and I think that anyone interested in collecting artifacts from all periods of Dragonballs’ extensive history should pick them up. In a way, they are the most unique Dragonball toys ever made.